We are very proud to announce the public preview of Acterys. 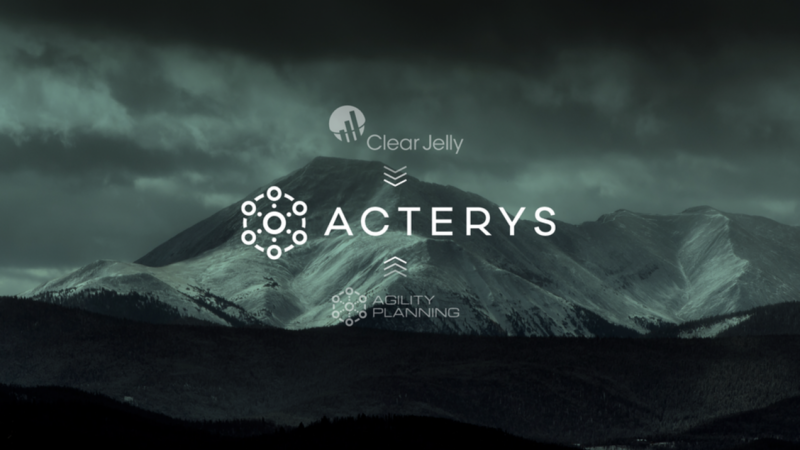 Acterys combines two previously separate platforms Agility Planning and Clear Jelly into one of the most comprehensive and versatile analytics and planning solutions on the market. As opposed to re-inventing the wheel and introducing unnecessary maintenance efforts, Acterys is built on proven, market leading platforms that are often already used at our clients. Using these platforms Acterys seamlessly combines analytics and financial planning capabilities that can be managed by business users. The solution connects to nearly any source and generates data models that incorporate professional data warehousing principles automatically or with minimal efforts. 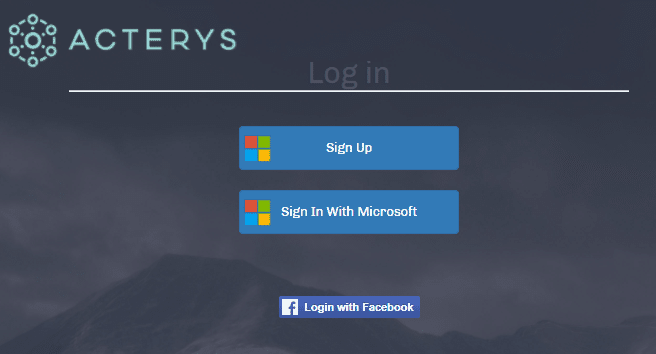 This means peace of mind for IT department as Acterys is built on the highly scalable, secure SQL Server / Azure ecosystem that is compliant with strictest governance policies. 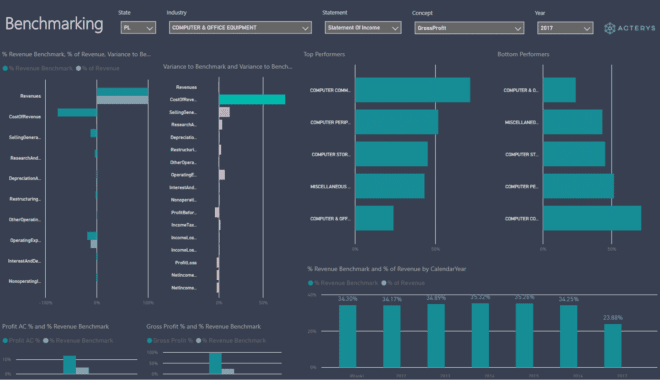 This is combined with dramatically reduced support efforts, as Business users can manage all front-end aspects themselves in the familiar Excel, Power BI and web browser environment. Around this technology platform Acterys offers a unique concept for software enabled services where clients can choose to support their team or outsource expert analytics and enterprise planning expertise on an ongoing basis at a fixed pricing. Acterys enables you to setup exact user rights on all aspects of the data model. User rights are managed using Azure Active Directory platform. This means that no additional layer of security is required. User can use their existing Windows Active Directory credentials. This also enables single sign on: you don’t have to login again when you are already logged in to the Active Directory account, reports and data entry forms will automatically take into account user rights and features available to the current user. A unique new feature in Acterys is the optional addition of one of the most comprehensive sources of corporate information: Finviews. Finviews includes all financial statement details of companies listed on NASDAQ and NYSE. The data is standardized and enables you to benchmark your organization’s details against any concept in the data stream for example how your organization compares to gross profit margin versus a specific company or an industry in the desired time frame. Acterys now includes entering data using relative changes, distribution of a specific value on every child in a hierarchy. The new Acterys Comments visual features a rich text editor that allows you to format comments using extensive formatting options like font size, color to links, and usage of format templates. Acterys now automatically provisions Azure Analysis Services (SSAS Tabular) Cubes based on the Acterys data model. 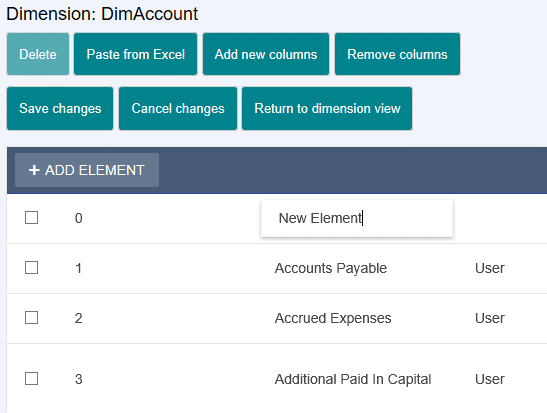 This means easier access and access to all SSAS features. Most importantly using the standard DAX language on a central server model in addition to local models in Power Pivot and Power BI (these can now also be published to the server and be used by different users). Acterys utilizes latest in memory technologies enabling unparalleled performance for write back and data modelling built on the proven MS SQL platform. 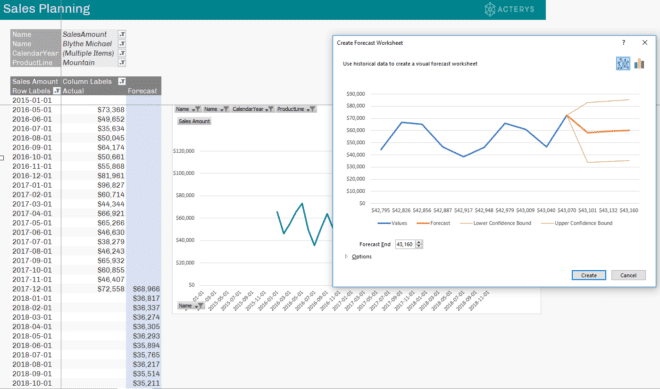 Acterys enables comprehensive data entry options (on base level/aggregation, relative change etc,) directly from any Pivot Table connected to an Acterys model. Acterys enables comprehensive data entry options (on base level/aggregation, relative change etc.) 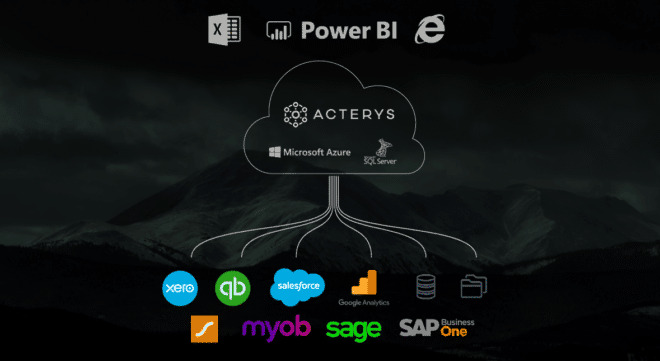 to an Acterys model with the native Acterys Matrix Power BI visual. Easily create powerful, interactive models that exactly mirror your business, either from scratch or automatically with a click. Incorporate any type data of data: financial, non-financial, HR, Payroll, CRM, Google Analytics etc. into your model. Simulate different scenarios and business driver changes like introduction of new products, changes in organisational structures, price and currency effects, etc. instantly. Acterys includes visuals that support IBCS standards for at a glance understanding and consistent communication. Horses for courses… Acterys’ multi-platform approach enables users to work from the front end that’s best suited for the specific needs. A flexible Excel/Excel Online Add-in for finance professionals that require flexibility and the power of Excel. 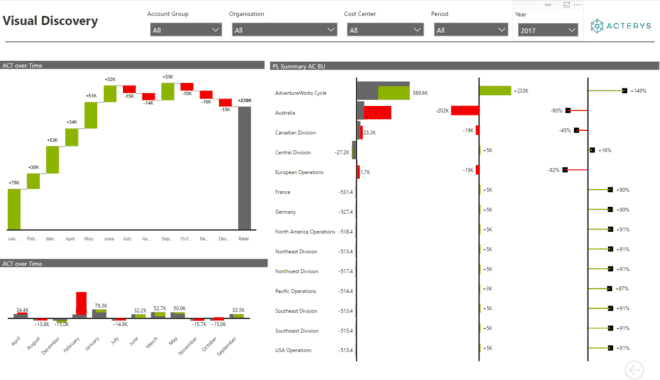 Different Power BI visuals seamlessly integrate professional planning processes with professional data discovery and interactive dashboards as well as mobile apps for large scale report deployment. Easily extend your model with powerful statistical and machine learning algorithms (e.g. regression, clustering, etc.) to enable data driven prediction/forecasting based and writing the results back as scenarios in Acterys. 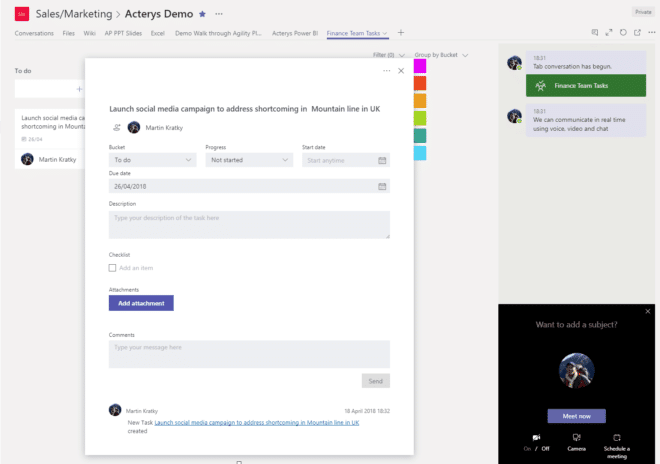 Acterys integrates with Microsoft latest technologies like Microsoft Teams, PowerApps and Microsoft Flow that allow you to setup real time collaboration, powerful workflows and tailored mobile/web analytical applications without any coding. Making the setup of automated notifications, approval processes and receipt handling among many other use cases a breeze. All this directly integrated with your existing email, office productivity applications and a variety of other sources. Acterys is the perfect platform for complex analytical applications that can be managed by business users without specialist IT expertise. From statutory consolidation, activity-based costing to advanced price calculations involving external services among others. 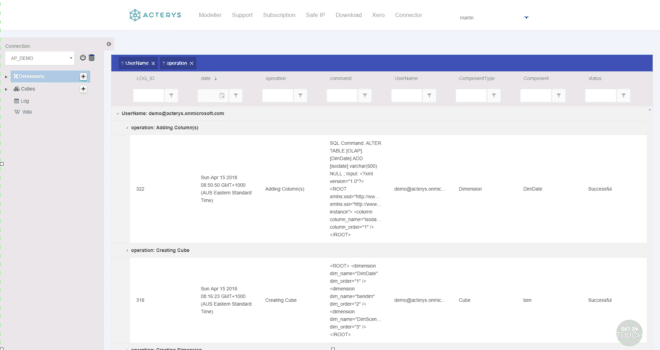 Every single transaction in Acterys is recorded in a comprehensive audit trail. You will know exactly: from where, by who, when and what for every single transaction.